This happens quiet often, since chess is a non-linear game, meaning that if opponent A wins opponent B, while opponent B wins opponent C, it does not automatically mean that opponent A will win opponent C. In fact, it may be just the other way around. Note: in this section we’re only talking about the problematic opponents, and not the opponents whose rating is higher and chess strength is greater. These are completely different animals. They should be treated differently and should not be confused with the problematic opponents. 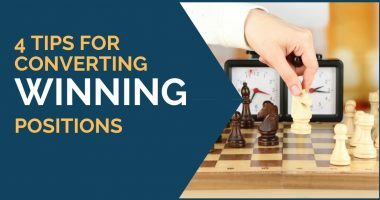 If you’re looking for tips against stronger opponents refer to my guide how to beat a stronger opponent at chess. Once we’re clear on what type of opponent we’re facing, we can continue our discussion on difficult opponents. There are many reasons why an opponent can be of that problematic type. The most common reasons are: psychology, style of playing and opening choice. 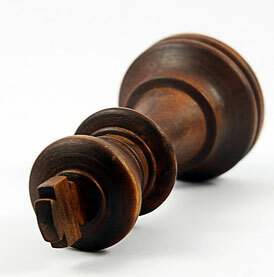 Psychology plays significant role in any sport, chess is no exception. I have already talked about psychology in chess, so right now I will just give some general recommendations. If you believe that psychology is the reason why that opponent is problematic, you need to first analyze what exactly creates the problem. You need to learn to ignore such factors produced by your opponent as staring, walking around, making sounds, eating, clicking with a pan, hitting the clock forcefully or distracting you from your thoughts in any other way. Many opponents would try to intimidate you in any way possible (and impossible) in order to get some advantage. Your job is to learn to deal with it. If it’s a sound that is annoying, you may consider covering your ears the way many professional players do. 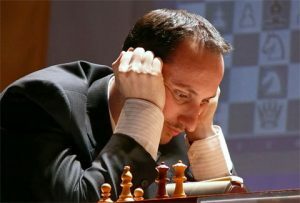 On the picture below V. Topalov shows us a very professional, grandmaster technique of ear covering. 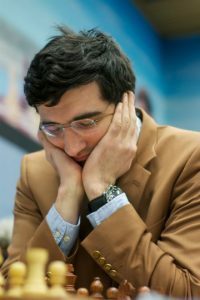 If you’re not completely satisfied with previous image you may want to review a similar technique (but “palms in”) introduced by former world champion V. Kramnik (see below). All other “non-chess” factors should be ignored as well. You should not try to analyze your opponent’s body language or facial expressions after each move. In fact, he can just fake them to confuse you. Just play chess. I always advocate playing the opponent, not the board. But, in problematic opponent case you should do exact opposite, play the board not the opponent. Try to ignore all outside factors. If you do that, your results will improve quickly. If the problem is not psychological it may be the style of playing of the opponent that gives you trouble. Some opponents play aggressively, always trying to attack. Some players play passively, accurately defending their position and looking for an opportunity to counter attack. Some opponents play somewhere in between and are called balanced. You need to analyze your problematic opponent and decide what style of playing he employs. Aggressive players hate playing closed, passive positions. They get bored and lose often. My advice is to play closed and slow games against these attacking maniacs. Against slow, positional players it is best to play sharp attacking chess (if it fits within your style, of course). They will feel like a fish out of water in these complex, tactical variations. Balanced opponents are probably the hardest type to deal with, since they may feel comfortable playing at both types of positions. Here you need to try different types of positions and see how your opponent reacts. Else, the best bet for you is to play the positions you’re most comfortable at. Opening choice is a concept closely related to the style of playing since opening dictates the type of middle game and even an endgame you’re going to face. Therefore, if your problematic opponent sticks to one opening and beats you repeatedly, it should be a signal for you to switch the opening and try something else. Again, try to chose the opening that is very comfortable to you but not for your opponent. Follow the rule of thumb: against attacking players play positional chess, against positional players play tactical. It’s that simple. The phenomenon of problematic opponents has been known in professional chess for a long time. W. Anand always had trouble against G. Kasparov who literally won most of the games regardless of color or tournament. Even though Kasparov and Anand were roughly the same level players, the first dominated most of the games. Kasparov barely lost any games against Anand. Your explanation is very clear but I still cannot get rid of my weakness against who are either aged or rated below . I always find good tactical moves against above rated players . 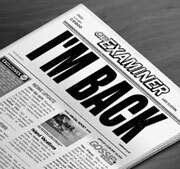 It is rather a psychical, It is not the same feeling I would say more confident, more sure and I pay more attention to every move . My question is : Can I oneday overcome my problem ?